Over the last fifteen years or so, karate seems to have been strapped to a roller coaster of a ride. All of a sudden, an emphasis on original practicality has become much more evident. In recent times, more and more karate-ka (karate students) are making an active effort in their study to bring the art more in line with its most important historical objective, as a civilian fighting system. This has created the need to concentrate on closer range combat applications, which when equated towards many of the movements in karate, all of a sudden help make the art come alive and prove it to be practically worthwhile once again. Others have chosen to practice karate for other reasons, may thoroughly enjoy and would rather stay with the more modern long-range sporting emphasis. Some may practice simply for the fantastic health benefits it offers. I personally think that the art of karate as it stands today has room for everyone to practice and take from it what they feel is personally appropriate. With the art now as widespread as it is, I don't think any person should have the entitlement to say what's right or wrong, apart from what may be personally acceptable to them. Similarly, my own views of karate have changed a great deal since I embarked on my first karate lesson almost eighteen years ago. Personally, I have little time for sport. I don't even watch it on television. I've therefore always considered myself a traditionalist and tried to centre my training towards the kata and the way the art was originally intended. This is what drives me towards my own constant study. I don't think of it as being right or wrong, just my own individual view. Others may decide to share the same reason(s) to train - others may not. In this article, I'd like to present some of my own thoughts based around the study of principles within karate, in a hope that others may be able to use my words to help them towards their goals as dedicated karate-ka. No matter why you decide to study karate (be it for sport, self-defence, health, enlightenment or a combination of these) there will be always something for you. This is because over time, the art has been able to develop in order to cater for the masses. Just look at how popular karate is now and the many varying reasons why people decide to train. In order to become competent in any physical skill though, you have to engage in what is termed ‘repetitive motion'. This is something in which the practice of karate has a large abundance of. In order for an action to become ingrained into your subconscious, it has to be repeated many times. As they say, ‘practice makes perfect'. A prevalent dilemma with karate though from a practical point of view is how we can actually perfect the technique(s) of something (fighting) that is by nature so diverse and ever changing. Before we take a look at this specific issue in more depth, it would be worth discussing at this point, what actually happens to us when we engage in any type of repetitive motion, be it through training or during any other everyday occurrence. 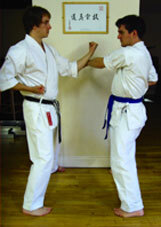 Fig 1: Training in repetitive motion using ‘kihon' (basic techniques). By continually undertaking a certain movement over and over again, our brains (over time) become more accustomed to the motion, thus it becoming more deeply rooted in our consciousness. This neural activity in the brain and how it can react and adapt to different stimuli is what makes our learning process so special. The more we repeat a physical movement (or rehearse a mental visualisation in the mind), the more we get used to it. The brain slowly builds neural pathways using synaptic connections and each time that a specific movement (technique or behaviour) is repeated; these pathways are made more efficient by matter, which is released by the brain called myelin. This substance is made up of lipids and proteins and lines the nerve fibres to protect and insulate neurons. This proves essential in the accurate and smooth transmission of electrical data from one nerve cell to the next. When we repeat a given sequence many times, myelin acts to increase the speed and ease of this ‘travelling' information between dendrites, which are in general terms, the transmitters and receivers of the brain's neurons. As we continue to repeat a movement more, a reduced amount of brain processing is required due to the pathways already constructed and effectively maintained through the role of myelin. This phenomenon is usually referred to as ‘muscle memory' and gives us the freedom to then concentrate on further factors such as (in terms of karate) applying power, speed or increased complexity. It's usually deemed that an average of at least fifteen or twenty minutes of continuous repetitive practice is required to ensure that your body and mind has fully absorbed a given movement. This is why I think that practice in the dojo alone cannot support the attainment of efficient muscle memory, since its normal for far less than fifteen minutes to be spent on each individual technique during a lesson. Consequently, the more we can repeat a given movement over a longer period of time, the more spontaneous we'll be able to act towards a reflex action. However, although this is a vital aspect, this is not the only factor to consider when effectively learning movements. For instance, the presence of adrenaline can seriously hamper fine motor function and make you act almost like a beginner again. This is seen often in top sports events such as golf, where masters at the top of their tree can sometimes make silly mistakes and lose the championship due to the uncooperative effects of stress. There has to be an infinite number of negative factors to consider when engaging in self-protection. So much so that to think of these at length would be quite perplexing indeed. Consequently, as we all know, the amount of response techniques required to balance out every combat situation would be truly staggering and simply too much of a challenge for us mere humans to sift through in such a high risk situation. I appreciate this being familiar ground for many and I can hear you all strongly confirming your acknowledgement to this. The generally accepted answer then - trying to dig further to uncover the common core principles of movement will as a net result, help us to react (or pro-act) much better to aggressive stimuli. This is because in theory, we'll be able to move freely according to any situation and have the adaptability to apply our ingrained principles to develop the techniques required in order to nullify the threat. Nevertheless, if this is so, I find it hard to accept why so many of us still depend entirely on the individual advancement of discrete karate techniques without having the vision to link them together via their common threads. Fig 2a & b: Learning to think outside the box. The principles of movement provide the key to unlock potential. In particular, learning how to apply core principles correctly so that your movements become more efficient and relative should really be at the top of every traditional practitioner's wish list. In the widespread modern dojo however, students still spend many hours perfecting the outward presentation and ‘look' of techniques, without ever applying these (or their associated principles) in a functional manner. Without attempting to answer the ‘why' and ‘how' during our training, we leave ourselves wide open to a life sitting on the fence, denying us the ability to drop off either side so that we explore the many vast pastures that lie just ahead of us. A key problem with centring your study of karate according to mere technique alone is that by nature, you miss out a critical link and this in turn, creates numerous inevitable limitations. If instead, you start to look at karate as a collection of common related principles and body movements, then the art in itself becomes endless (as it should). This is because we can then adapt an infinite amount of techniques based on only a few core concepts and motions. The realisation of equating principles first struck me as being significant a long while ago when I was teaching a small class of black belts. We were practising some renraku waza (combination techniques) and I decided to change the movements around a little to make them appear outwardly different. By utilising the same principles and gross movements, I changed the ‘look' of the combinations and asked my students to perform them. All of a sudden I could see as clear as day, the primary limitation of learning techniques for technique sake. Almost all of the black belts became instantly confused and frustrated because their bodies could not do what I asked of them well. The movements in essence were no different since I simply asked them to employ identical principles, only using different techniques. The students were so conditioned to moving in a particular way (technique) that their ability to ‘break free' was seriously hampered. Likewise, dissecting certain basic movements that had been repeated thousands of times before and analysing the different principles for application proved also quite demanding for the class that day. It seemed to me that the inability of the class to adapt techniques for changing situations through common attributes was not a fault of their own, but a fault with how they had been taught in the first place. If you learn only to stay on a particular path (conditioned discrete techniques), you won't really know how to get back onto it if you ever get lost (having to adapt). By stepping off the path now and again (learning to adapt), you will become free to roam around, your leash will be slackened considerably and if you do in fact find yourself lost, you'll have a much better chance of returning home safe. When Bruce Lee talked about this way of learning when developing his Jeet Kune Do in the sixties, it was seen by many, as a revolutionary way of thinking. In actual fact, Lee had done nothing more than place emphasis on a vital element within traditional martial arts training (the equating of common principles and movements) that had been and still is by many, commonly disregarded by our own modern ignorance and misunderstanding. Contrary to uneducated belief, the mastery of specific techniques does not hold amazing secrets. It is my opinion that the real secrets of karate are found within its own fluid adaptability. Studying the principles of karate instead of technique alone will (as the famous Okinawan master Chokki Motobu once so eloquently put it) allow you to “bend with the winds of adversity”. It's been proven countless times over thousands of years and throughout many different species, that if you can't learn to adapt and evolve through life, you risk facing almost guaranteed destruction. This has never been more evident than in our own beloved art of karate. 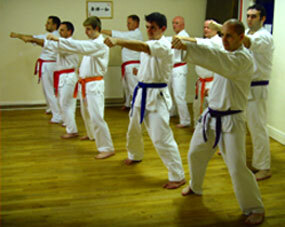 For karate to survive the modern era, it had to become accessible for the masses to learn. Therefore, we know that Master Anko Itosu altered many of the techniques in such a way to become more ‘safe' to learn. However, Itosu was certainly very clever in his approach. He not only succeeded in providing catalyst for karate's future popularity, he also ensured that the alterations he made still held the core principles of the devastating fighting art he taught. Consequently, he effectively allowed the practicality of the art to remain dormant until a point in which a particular student was either responsible enough to learn or experienced and open minded enough to develop for him/herself. Without the ingenious foresight of Itosu, karate would more than likely have been lost forever. As with everything in life, conditioned techniques without an understanding of the underlying concepts simply do not have the ability to adapt and respond in changing circumstances. They are forcefully set in stone. In reality though, everything is transient. Principles therefore, always give birth to technique and a particular technique cannot grow initially, without strong principles (roots) to sprout from. Thus techniques should be in actuality, the transient parts of the actual application. As a comparable, I prefer to liken the study of karate principles to the wonder of the written word. As we all know, the English alphabet is made up of 26 characters (A to Z). By putting certain characters together in a specific order, we can create words. By putting certain words together in a specific order, we can create sentences. By putting certain sentences together in a specific order we can create paragraphs. I'm sure by now you can all see where this is going. Paragraphs can make pages and pages can make whole books. Throughout the numerous lives before us, making use of those mere 26 characters of the alphabet has created many timeless masterpieces. Looking at the study of karate, we can easily equate ‘books' to ‘techniques' and the ‘characters of the alphabet' to the ‘core principles', which hold the art together. Fig 3: Correcting technique is only useful if thestudent is also exposed to the why's and how's. It would be incredibly difficult for anyone to consider writing a book by hand, if they did not first understand the alphabet of their own particular language. Likewise, many karate-ka attempt to consciously learn a definitive number of techniques, without having the real ability to ‘read' the essence of them. It is often said in writing cliques that ‘a new book is nothing more than a bunch of old books' (a collection of old information re-generated into a new format). This is also very true when developing techniques in karate. We can use similar principles to create many varied movements and motions. In this way we are no longer restricting transience, be it consciously or subconsciously. This thought alone leads us now into a very interesting question. Why then do you suppose we are bound by a historic syllabus of definitive kata and kihon within our art? So far we have discussed in depth about the idea and importance of principle based training. In part two of this article, we will expand this idea further, answer some of the questions that have already been naturally raised and explain how this strategy can be implemented into your everyday training.